Erich Mühsam (1878-1934) was a German-Jewish antimilitarist anarchist essayist, poet, and playwright. I can check most of those boxes. I tried anarchy in my 20s; it didn’t fit. And while my maternal grandparents were German, I started life in New Jersey. Since 2003, I have maintained my writing office, research library, and a small performance space in the same building in Berlin where Mühsam worked and lived with his wife Zenzl. Alt-Lietzow 12. There is a plaque dedicated to Mühsam beneath my window. His spirit is everywhere here. He sat where I sit. Climbed the steps I climb. Feared what I fear. When I first began to work in this building, as close as it was physically to Mühsam’s world, still it was many other worlds away. Europe was at peace, so happily uniting. In 2004, ten new countries would join the E.U. From Malta and Cyprus in the south, to the Baltic states Estonia, Latvia, and Lithuania in the north, with much of Eastern Europe in between. Peace and the sweet promise of prosperity characterized the day. The Schengen Treaty meant borders were coming down, not being reinforced. And across the ocean, the United States with its Statue of Liberty still loomed as a beacon of hope to less privileged peoples everywhere. But, as the saying goes, that was then and this is now. Today, the world looks uncomfortably closer to the one Mühsam might recognize. Nationalism is again ascendant in Poland, Hungary, the Czech Republic, and Austria. The right-wing AfD now sits in the Bundestag as the third largest political party in Germany. And – I weep to write this – the United States is turning from its traditional role as uniter to join the ranks of those ascendant nationalists. Storm clouds, if not storm troopers, loom outside the window. The Nazis came quickly for Mühsam. He was killed at the Oranienburg concentration camp on July 9, 1934. My father had better luck. He escaped the Nazis, fled as a 14-year-old Jewish refugee from Yugoslavia to the U.S., and I was born safe and secure on July 9, 1956 – twenty-two years to the day after Erich’s murder. In May 2019, on the centennial anniversary of Mühsam’s Revolution of Love, we will present here, in the building where he later worked and lived, a cabaret marking the occasion. Text and performance will go beyond reflecting on Mühsam’s day. They will also attempt to shed some light on our own. 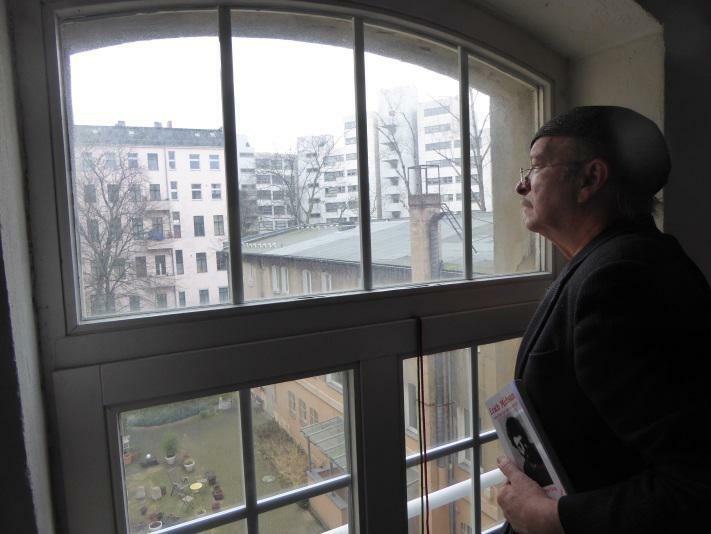 Michael Lederer is an American writer who lives in Berlin and Cadaqués. His novel Cadaqués was published in 2014.